What's that you say? You hate Valentine's Day? Hey, I feel you. It can be such a jerk sometimes. But today I've teamed up with the awesome Emily at Clementine for a giveaway that is going to make you want to pour a glass of champagne, put on some Joni Mitchell, and romance YOUR OWN SELF. What we are saying is, honey, be your own Valentine. 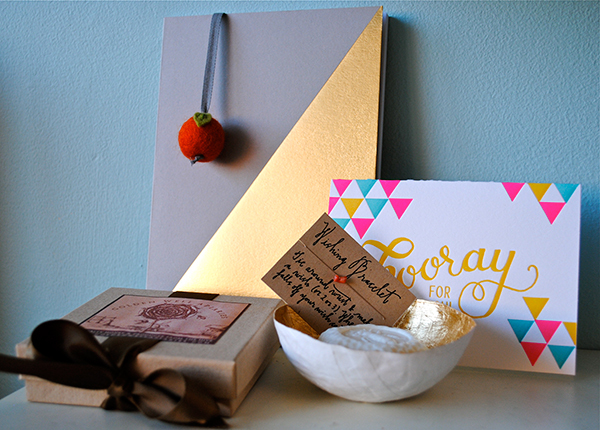 This giveaway contains such queenly items as a mini milk & honey soap, a slate & gold geometric notebook , a felt Clementine bookmark, a letterpressed "Hooray For You!" card, a hand-built gold leaf paper dish, and of course, a wishing bracelet. Oh, and just some amazingly indulgent and beautiful honey caramels, infused with grapefruit essence, enrobed in milk chocolate, dusted with bee pollen and sea salt, and wrapped in pistachios. NO BIG DEAL. I'll choose a random winner and announce it on February 14. And go visit Clementine in the meantime -- there is lots of other way good stuff over there. Thank you so much, Emily! And, Happy Valentine's Day, Honeys! Newer:Your (Fat) Tuesday Headless PhotoOlder:Camp Notes!